Description: Robin-sized and short-billed, this unbanded plover has an upright posture. During the breeding season, look for the black belly extending from the throat to the end of the tail. Golden, black, brown and white marks are distinctive. They show an overall gray plumage with darker speckling during the nonbreeding season. Similar Species: This species was formerly classified with Pacific Golden-Plover as Lesser Golden-Plover. Pacific Golden-Plovers and European Golden-Plovers have not been reported in the Great Plains but are similar in appearance. Black-bellied Plovers in nonbreeding plumage offer the most challenge for Great Plains birders. Look for the absence of black wing pits in flying American Golden-Plovers. 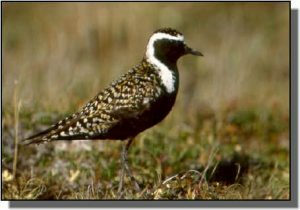 American Golden-Plovers are noticeably smaller than Black-bellied Plovers. Comments: This species breeds on the arctic tundra, winters in coastal and inland areas of southern South America and is primarily seen in the Great Plains during spring migration foraging in short grass areas including recently burned tallgrass prairies. Fall migrants are less common in the central and southern Great Plains than in the northern Great Plains.